John Lloyd Wright, son of Frank Lloyd Wright, designed this 2,900 square foot house of block construction with stucco finish. Like his famous father, John designed homes in the style of architecture known as “Prairie School”. 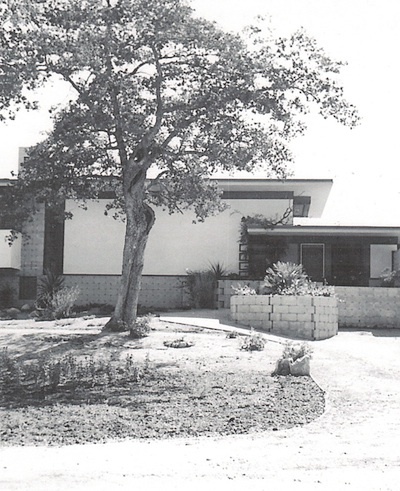 Wright received a commission to design this house in 1959 (the year his famous father died) by businessman/rancher Willis H. Merrill and his wife Margaret (Peggy). The house sits on a 10.5-acre bluff. It overlooked the Wonder Y Ranch across the road, which the Merrill’s had acquired in 1955. Willis, who served as first President of Valley Center Rotary in 1967, suffered a stroke in 1973 and sold the Wright house. From the mid-1970s to 1992, the property was owned by Clayton Blehm. Under contract to the California Youth Authority, he operated a boarding school for troubled youth at the site. The original Wright-designed garage was converted to school offices, classrooms and, later, to additional living quarters. In 1992, a bank foreclosure resulted in a government agency sale of the property to Edythe Irish, a San Diego County Superior Court clerk who moved into the home. it to a Trust. The property went into foreclosure in 2012 and was purchased by Angelyn Scarvaci, its present owner.